We live in a world where there is a need to constantly stay in contact with one another. People use instant messaging, text messages, and video chats to speak to people all around the world. Ideally, camping is about taking a few days away from the daily grind and getting back to nature. This is not always quite so easy, however. For one, if you need to stay in touch for work purposes then you are going to need to stay contactable. With a portable solar panel, you will be able to ensure that your smartphone and other mobile devices remain charged for the duration of the trip. Therefore, people will always be able to contact you. Of course, you don’t just need to communicate with people far away. Sometimes, you need to be able to reach the people that you are camping with. For instance, if you and your fellow campers are splitting up for a hike, it is a good idea to take two way radios with you. This way, you will be able to make sure that everyone stays safe and that you know of each other’s whereabouts. 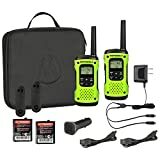 There are numerous two way radios such as the Motorola T600 H2O that are rechargeable and can be charged via a solar panel. IP67 Waterproof: Count on the T605 H2O two-way waterproof radio to keep you connected whether on land or at sea. With its IP67 standard, the T605 H2O withstands constant submersion of up to 1m for 30 minutes and repels the heaviest rain. Advanced Built-in Flashlight with White and Red LEDs: Select the white LED setting on the built-in flashlight to light your way during evening activities, unexpected emergencies or power outages. 23 Channels Each with 121 Privacy Codes: With 22 channels and 121 privacy codes, totaling 2,662 combinations, it's easy to find an available channel. It can be difficult to say goodbye to the creature comforts that you are so used to when you are at home. Having to spend several days outdoors without various appliances can be quite jarring, not to mention frustrating. Sometimes, it is the smallest things are difficult to do without. For instance, it can be quite tiresome to have to rely solely upon flashlights to find your way around your campsite. It is much easier to string up some lights that can be powered by a solar panel like the Goal Zero Sherpa. When the nights get really cold and your sleeping bag just isn’t doing the trick, you can always plug in a travel electric blanket. While camping is supposed to test your survival skills, being in a constant state of discomfort is no fun. By using a solar panel to power small products to make your life a little easier can make a big difference. At the very least, you certainly may enjoy your camping trip a little more. At home, you are used to constantly being entertained. With mp3 players, televisions, laptops, smartphones, and more, most people are used to having something to do. When you are out in the wilderness, however, you may find you have only the chirping of crickets to keep you interested. This can be especially frustrating if you have little ones and you are trying to keep them occupied once the sun has gone down. With solar panels, you can charge a laptop or tablet, and make sure that the little ones have something to watch until bedtime. Or, they can play games on their mobile device, if they want to. While adults may be content to not have a screen to stare at, one thing that is always appreciated on a camping trip is music. Since there are many solar panels such as the Poweradd 40W that can charge Bluetooth speakers, you can all listen to your favorite tunes. The entertainment factor is particularly important if everyone has had a long day and just doesn’t have the energy or patience to play board games or talk. USB port (5V/2A) for charging your 5V powered gadgets, and 18V DC output (18V/2.2A) for charging your laptop or other 18V powered devices. What You Get: Industry-Leading 24 months limited product warranty! Poweradd 40W solar panel, laptop connectors, DC cable, user manual. It has been established that it is difficult to give up various electronic devices that you have gotten so used to. If you are not willing to give up some of these comforts, typically, your only option would be to head to a campsite that has power sources. There is a major disadvantage to this and that is that you still have to remain on the fringes of a town or a city. You can’t really set off into the wilderness and enjoy nature up close. Not to mention, you will be surrounded by numerous other people which can make your camping trip a lot noisier and less enjoyable. With solar panels, you get to have the best of both worlds. You get to have your very own power source and as it is portable, you can take it wherever you want. This means that you can head out as far out as you want and still be comfortable. You don’t have to compromise in any way. It doesn’t matter how low-key you want to get with your camping, you are still going to need batteries to power at least a few items. For instance, unless you are planning on walking around with a burning stick in your hand, you will require a torch and the batteries that go along with it. The same goes for other light sources that you are planning on utilizing. Now, on one hand, it is easy to imagine that you are using up clean energy and this is partially true. However, what about when you have used up the batteries, what then? Well, you will have to throw them away and they are going to end up in a landfill somewhere. This is not the case with solar panels. You can continue to use them over and over again, with no impact on the environment. So, if you want to be as considerate about the environment as possible, then portable solar panels are the way to go. Do you want to spend more than just a couple of days exploring the remote countryside? One impediment to such a trip would be that you are going to run out of power sources if you rely on batteries alone. Either that or you are going to need to take so many with you that it will be an inconvenience. With portable solar panels, however, it is just a matter of keeping one panel kit in the sun for as long as necessary. You can keep recharging it every day so that you will not have to worry about running out of power. When is a Portable Solar Panel Beneficial? There are numerous advantages to carrying a solar panel kit with you when you go camping next. However, you need to know when it will come in handy and when you may have to do without it. As you can imagine, the weather has a large impact on just how well your solar panel will work. Contrary to popular belief, your portable solar panel should be able to generate some power even when there are clouds or it is raining. Nonetheless, it is not going to be able to produce as much. In fact, the solar panels’ efficiency could be lessened up to 80 percent in such conditions. As you well know, there is a limit to how much the portable versions can produce. When this cut down even further due to the weather conditions, you will have to determine if it is really worth packing it for your trip. The other thing that your solar panels need is time in the sun to really soak up all of that charging energy. This means that you will have to settle down for at least several hours in one location for it do so. If you are going to be constantly on the move, you may find that the panels will not charge as well as you like. In turn, it will be unable to charge many of your own electronic devices. Monocrystalline: if you are looking for the greatest efficiency, you should opt for monocrystalline panels. In bright sunlight, you can expect this panel to provide around 22 percent efficiency. While these panels tend to be more costly than other options, they do have the advantage of being more durable. Polycrystalline: like monocrystalline panels, polycrystalline is made from silicone crystals. However, although quite powerful, it still has a lower efficiency at around 18 percent. Polycrystalline is a better choice if you don’t mind buying more panels at a lower price. CIGS: The Copper, Iridium, Gallium and Selenide panels were once wildly popular due to the fact that they were easy to transport as they could be rolled up. Also, these panels perform quite well in dim light. However, they do degrade quite easily and are not as nearly efficient as the options above. Not all panels are capable of producing the same kind of power. Therefore, you will need to calculate just how much power you will require at any given moment. Start by determining what are the gadgets or electronics that you will be taking with you. For instance, is it just a phone, lights, and perhaps a GPS device? In this case, you should be able to do well with a SunJack (20W). As a rule of thumb, however, you should get a panel that is capable of producing more power than you actually need. For example, if you are going camping with a large number of people, small children included, you are going to need something with greater power output. With 400 watts, the Goal Zero Yeti is ideal for these purposes. Of course, if you aren’t going to be using the panel much, don’t go overboard. This is because the panels that do use up a lot of power typically cost a lot more as well. So, if you don’t want to make an overly expensive purchase, you should make some calculations. At the moment, portable solar panels are focused on charging smartphones, tablets, and other similar devices. Now all of these gadgets rely upon USB ports and cables to charge which is why most panels are equipped with them. As you well know, not all devices use USB ports and cables to charge, however. This obstacle can easily be overcome by using an inverter. This will allow you to add lights, laptops, and other gadgets to the panel and be charged as well. Should You Get a Portable Solar Panel? There is no denying that a portable solar panel is a great investment. It makes camping a lot easier, not to mention more fun. 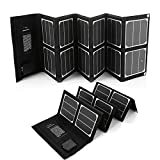 The only downside with these panels, however, is that they create the opportunity for you to bring your phones, tablets, and even laptops camping with you. However, camping is not about how many gadgets you can take with you. Instead, it is about enjoying nature, taking a break from all the hustle and bustle, and in general disconnecting from the world. All of this can be very difficult to do when you are constantly tempted to bury your face in the nearest screen. It can be argued that more often than not, electronics have no place when you are camping. So, unless it is for safety reasons or you need to stay connected for work, it is a good idea to just try and rough it. Now you know how portable solar panels can improve camping and why that may not always be a good thing.